I don’t know about you, but it does not happen so often anymore that I have a "wow" moment. It is unfortunately natural or human that the more things you see, the fewer things become striking. Of course as it is my mission and the mission of this blog to keep the wide-eyed “tourist” perspective, I still make it a point to live every experience as a new one and not take it for granted even if I may have seen something similar elsewhere. However, this deliberate awareness and intentional appreciation is not the same thing as a moment of “wow.” A wow by my definition is always uttered unintentionally, sometimes unexpectedly and often uncontrollably. Decorated cupcakes are still adorable no matter how many times I see them! My head submerged in Maldivian water and coming face to face with my first foot-long tropical fish, I uttered wow through a snorkel. After driving to the Grand Canyon in the dark and waking up on a January morning, I uttered wow as I got my first glimpse of these great crevices. These are places that don’t disappoint, but they are nonetheless somewhat obvious. It is not really unexpected to have wow moments in places like the Maldives and the Grand Canyon. Yet, this is partly why I felt so surprised to have one of these moments in ... Brussels, of all places. Not that I ever had anything against Brussels, but I know of a lot of people who do and sad to say, I guess I didn’t expect much of the city. Based on this we even figured that Brussels might not be worth the 2 short days that we had scheduled in the country. So we split our weekend between Brussels and Bruges. Bruges, by contrast, had oodles of compliments from people we knew. 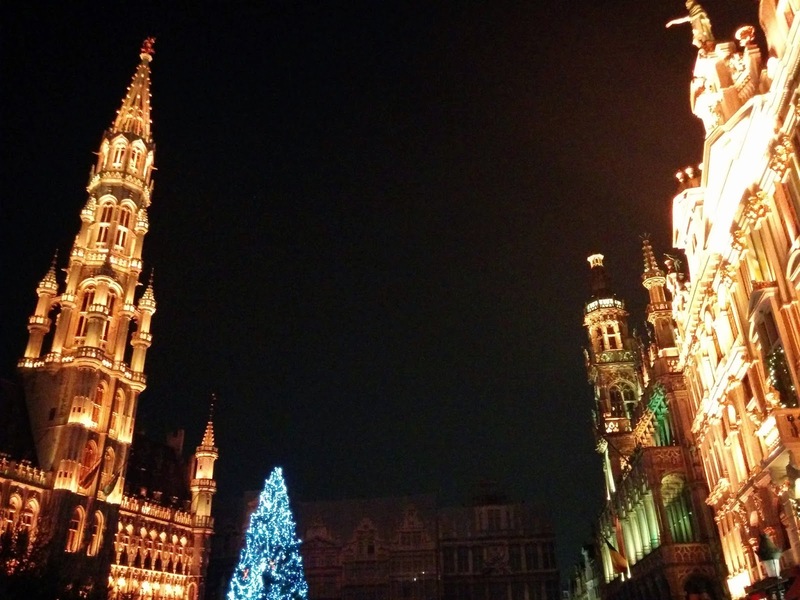 But, in addition to my lack of expectation about Brussels, the truth is that I was also not in a mood to be wowed. Still kind of recovering from the highs, hype and hysteria of the wedding and honeymoon, I have been quietly stewing in the lull of the aftermath, satisfied in seeking recovery. So the truth was, I didn’t even want to go on another trip that weekend, even if it was for the Christmas markets... a truly odd emotion for me. Christmas markets have always been my thing and I have been like the annoying child tugging at the coats of the adults to try to get others to go with me over the years. Some years I succeeded like 2012 when we went to Copenhagen, some years I did not like last year when Piazza Navona with its generic carnival games and cheap Christmas-related junk had to do. This year, it was my husband who was keen to go; he had caught my bug and I half-willingly complied. So maybe this reluctance of even being in Brussels was part of my surprise of how I felt so moved. 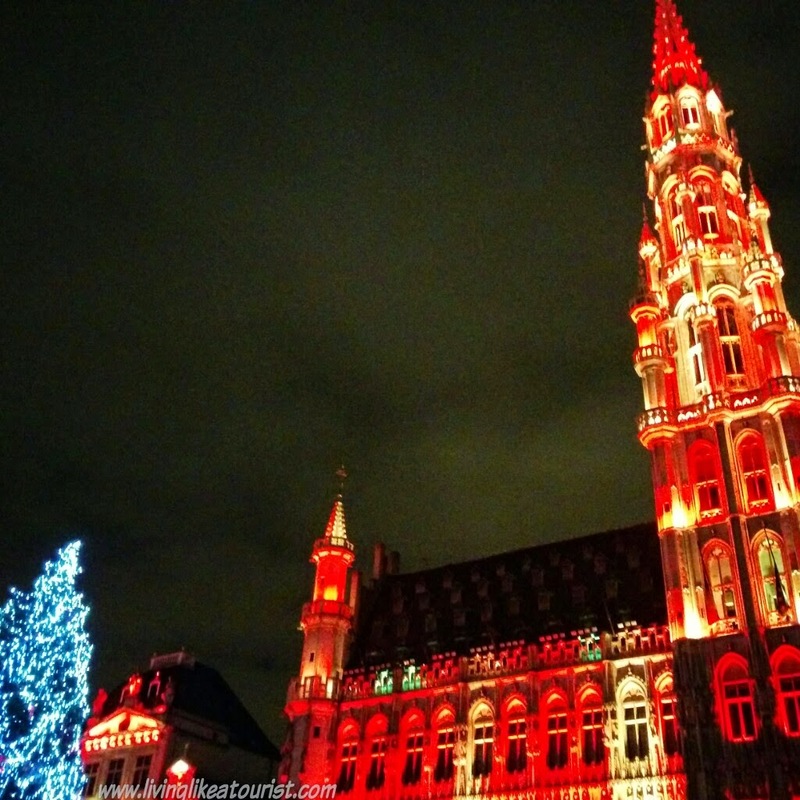 But that night in Brussels after returning from a day in Bruges, a city that is quaint and cute but certainly not up to the hype, we walked aimlessly without plan or direction following the ebb and flow of the crowds. 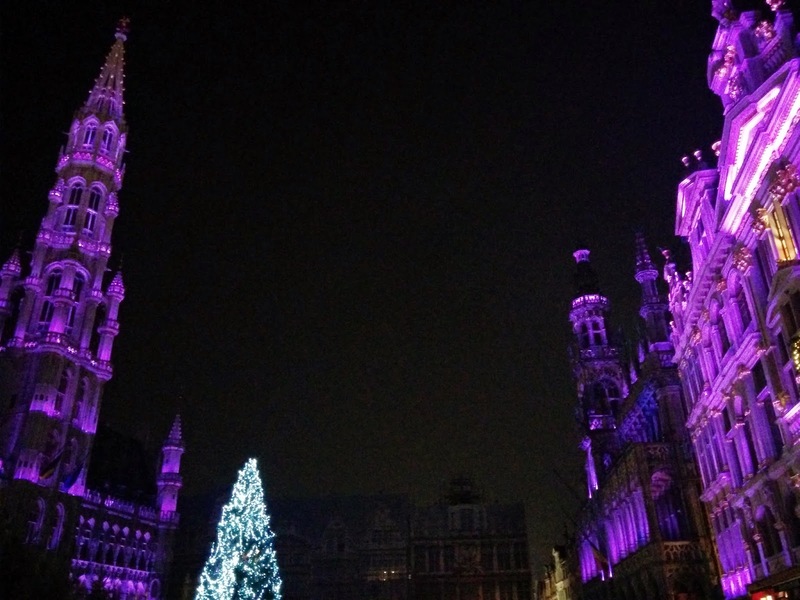 We knew nothing about the events, or the layout of the festivities, having only based our decision about Brussels on an article in some magazine saying that it had one of the nicest Christmas markets in Europe. We didn’t even know where the market was on the city map that we got last minute from the hotel. Yet, we walked with the idea that we would surely come across it. What we came across instead was the entry to their main square, La Grand Place, and as we walked in, it exploded with color. The parliament was fire red then melted into a white glow then iced over into wintery blue and then warmed into a deep purple, all the while accompanied by a surround-sound of classical, Christmas music. On all four sides of the square, buildings were consumed with color, fading in and out along with the pace of the melody. And the grand place, being indeed grand, made onlookers feel that much more petite in its presence as it gave its show. Towering buildings at every corner, 80-foot Christmas tree in the center and a manger the size of a small house in the center of the square- all came alive for those fifteen minutes, all quieted the audience with its song, all stopped you in your tracks to make you feel the awe that music and light can inspire and the majesty and magic that this season holds. And as I, indeed stopped in my tracks, I whispered, maybe only loudly enough for me to hear, an unintentional, unexpected and uncontrollable: wow. SNOWMEN cupcakes are the best!!! Husband :):) also I ADORE Christmas markets and hope we can go to one together soon!